When adding a new user account in Windows 10, a profile for the account is automatically created when the user signs in to the new account for the first time. A user profile is a collection of settings that make the computer look and work the way you want it to for a user account. It is stored in the user's C:\Users\<user name> profile folder, and contains the account's settings for desktop backgrounds, screen savers, pointer preferences, sound settings, and other features. User profiles ensure that your personal preferences are used whenever you sign in to Windows. 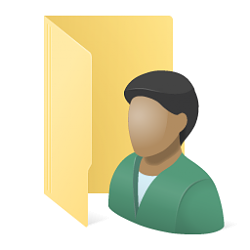 A user's profile folder also contains their personal folders such as the 3D Objects, Contacts, Desktop, Documents, Downloads, Favorites, Links, Music, OneDrive, Pictures, Saved Games, Searches, and Videos folders. Since a user's profile folder is automatically named by Windows by default, it will not always be named what you may have wanted its name to be. This tutorial will show you how to change the name of a user profile folder for any account in Windows 10. You must be signed in as an administrator to change the name of a user profile folder. Changing the name of an account's user profile folder will not change the account's user name. 1. Sign out the user account (ex: "Brink2") you want to change the name of its user profile folder (ex: "C:\Users\Brink2.BRINK-W10PC"). 2. Sign in to any administrator account on the PC that you are not changing its user profile folder name. If you do not have another administrator account, then you can enable the built-in Administrator to sign in to do these steps in. Make note of the SID (ex: "S-1-5-21-237214570-1361766723-3061440971-1015") for the account (ex: "Brink2") you want to change the name of its user profile folder. You will need to know this SID in step 6 below. 5. Press the Win+R keys to open Run, type regedit into Run, and click/tap on OK to open Registry Editor. Substitute SID in the registry key path above with the actual SID (ex: "S-1-5-21-237214570-1361766723-3061440971-1015") from step 4 above for the account (ex: "Brink2") you want to change the name of its user profile folder. Make note of the current full path and name (ex: "C:\Users\Brink2.BRINK-W10PC") and new name (ex: "Brink2") for this account's user profile folder. You will need to know both in step 10 and step 12 below. 10. Open File Explorer (Win+E), and navigate to the original full path of the user profile folder (ex: "C:\Users\Brink2.BRINK-W10PC") from step 8 above. 13. You can now close File Explorer if you like. I went through the procedure twice, both times when attempting to rename the user folder using windows explorer the message came back "can't change the name, the folder/file is open in a different process" - or words to that effect. Did you sign out the account you wanted to change the name of its profile folder, and sign in to a different admin account? Yep, I solved it by booting into Safe mode and renaming it with win explorer. BTW, I've been a fan and Big user of your seven and ten forums for years - best on the net! You must have a team of at least 40 people working on these forums - amazing! Thank you. We have a great team in the mothership. I tried restarting, shuting down and in each case only logging in with the newly created "ADMIN" account (not a very imaginative name). In each case I checked the SID name as still being changed to the desired name (it was) and attempted to change the folder name with the same error message "can't it's in use". A possible reason is I don't have any password for logging into the account whose profile folder name I'm was attempting to change or the newly created "ADMIN" account and I normally automatically log in to the account I was attempting to change. I was going to get a boot USB drive and change it that way, but thought I'd give Safe mode a try first, and it worked. Apparently Microsoft opens all account profiles when anyone logs on. Usually, only the accounts that are signed in would be in use. If you had switched user from the "ADMIN" account instead of signing out, then that could be a reason why it was in use. So this will only change the user name and not the Login name Right?? Works just as you said. Brilliant discovery. Everybody else has always said this could not be done. I assume you didn't hear them & that's why you were able to do it. Correct. As Denis posted above, this tutorial will only change the name of the account's user profile folder, and not the account's user name. If you wanted to change the account's user name, you could use the tutorial below instead.